We all know the sign for handicapped parking. However, it is not as clear that everyone understands what allows you to park in a handicapped-parking spot. Read on to learn what qualifications you need to get a handicapped-parking permit and to avoid any tickets or fines. If you have a removable windshield placard or a handicapped-license plate, you are already in the know. These placards are designed in accordance with the law. Only those who have a legal handicapped-parking permit can park in designated handicapped-parking spaces. Handicapped-parking permits are usually acceptable for up to five years. After that, you must renew your certificate. All authorized vehicles must have the permit displayed in a clear, visible place. Although qualifications vary from state to state, you most likely qualify for having a disability if you have mobility problems that substantially impair your ability to move around because of paralysis, lung disease, cardiac insufficiency, wheelchair confinement arthritis, foot disorder or other medical conditions that cause you to use a brace, cane crutch or other assistive device. What does my state require? What constitutes being disabled may be different from one state to another. There are also subtle differences in each state as to what is required to get a handicapped-parking permit, so be sure to check with your state guidelines. Some states give free permits, and other states charge a processing fee. Your doctor might be required to sign the paperwork in order for you to get a permit, so be sure to talk with your physician early on. You may have difficulty walking because of an ailment or chronic disease, but this may not necessarily qualify you for a handicapped-parking permit. What if I drive a disabled person? Caregivers may also qualify for a permit so that they can transport a disabled person. Again, check with your state's requirements to find out. Sometimes a disability is not outwardly noticeable. 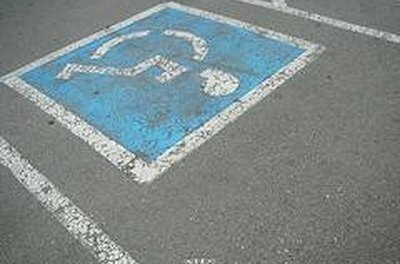 So the next time you see someone getting out of a car in a handicapped-parking space, be sure to notice whether that person has a placard in the car or a handicapped-license plate before giving him a dirty look for parking there. Rivlin-Gutman, Annette. "Handicap Parking Qualifications." , https://legalbeagle.com/5084265-handicap-parking-qualifications.html. Accessed 21 April 2019.